I hope you enjoy introducing new ingredients and flavors to your pantry as much as I do. These products are mostly available at nearby Asian Markets, Whole Foods Markets as well as online. The products in “current favorite” section are my personal choices based on good balance of quality, price and availability for every day use. The list will be updated occasionally when a better selection is discovered! Soy Sauce. You know this. Good balance of quality and price. No msg. Naturally brewed. No added alcohol or preservatives. Certified Organic. White sesame seeds. Sold as whole seeds, ground seeds and paste. Look for pre-roasted or roast your own. Only the finest ingredients. Made in Colorado. Dried Kelp. Rich in minerals and vitamins. Natural flavor enhancer. An ingredient for dashi broth often paired with bonito flakes. Macrobiotic, vegan, raw and gluten-free. What else? High quality Hidaka kelp from Hokkaido, Japan. Good grade Ma Kelp from Hokkaido, Japan. Hand harvested and sun dried. 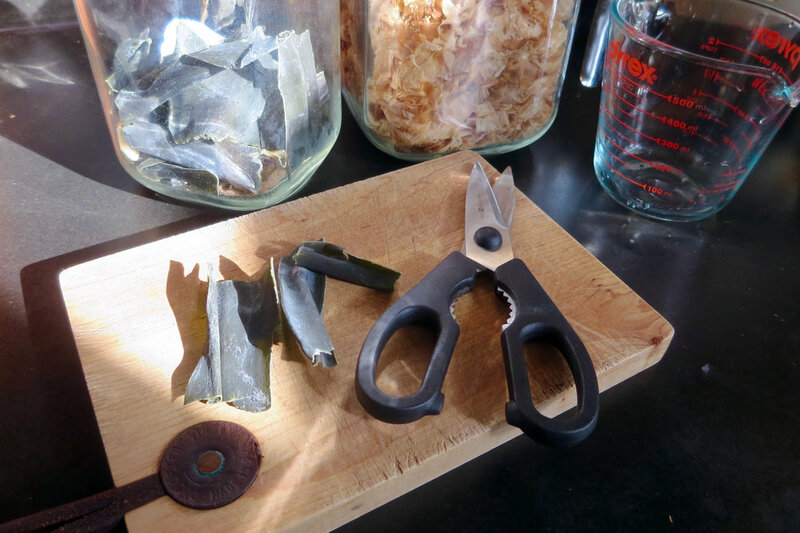 Wild Seaweed from the Mendocino Coast. Mildly sweet cooking sake. Bringing out natural flavors. Adding complexity and graze (like in teriyaki). Helping maintain the natural texture and prevent ingredients from crumbling while being cooked. Avoid Aji Mirin. Well known brand in Japan with long history. Made from premium Sacramento rice, koji and yeast. Delicious, complex and versatile. Widely available in California. Imported from Japan. No msg. Also available at edenfoods.com/ Compare the price! Organic. Non-GMO. Traditionally handcrafted. Product of Japan. Smooth and mild flavor compared to fruity and tangy white wine vinegar. Works great with Japanese dishes. Traditionally brewed from California grown rice. Dried bonito flakes. Smoky and flavorful. It makes dashi stock as well as being sprinkled on salad, soup, rice and tofu. They will dance on a steaming hot Okonomiyaki. Company with long history from Toyama. Good quality and value for everyday use. Good quality and value for everyday use. Fermented soy beans. Red miso is richer and saltier. White miso is sweeter. Awase (blend) is somewhere in between. Start with an awase blend, if it is your first purchase. People often buy red and white to make their own blend to deepen flavors. It is being translated as red on the label, but it is actually a blend. Product of Japan. No msg. Good mid-range choice. Product of Japan. No msg. Another good mid-range choice. Well known brand in Japan with long history. 100% organic. No additives. Made in USA. 1 1/2 years aged. Roasted sea weed that comes in thin sheets. Ready to use. Rich in proteins, vitamins and minerals. It is used for wrapping sushi. It can also be shredded on rice, salad, ramen, pasta etc. Seal the bag to keep it crunchy. Wave it over a burner to bring back the crispness when it apears soggy. Avoid seasoned nori. Product of Japan. Well known brand. From Yanagawa offshore fish farms in Fukuoka, Japan. Only imperfect shape sheets are packed for every day use with better price. Good value. Finest grade. Hand harvested and naturally dried. From Ise Japan. Citrusy, salty and spicy. Made from yuzu citrus, salt and green chiles. It adds extra kick of heat and flavor to soup, yakitori, sashimi, gyoza, pickled veggies, noodles and hot pot. Use in small amounts. It lasts more than 6 months to a year. Keep it in a refrigirator once opened. From Fukuoka, Japan. Their signature produst. Artificial color free. Fragrance free. From Kyushu, Japan. Great for sushi, sashimi, meat, cold soba and even for potato salad for an extra kick. Most products sold as wasabi are typically some kind of horseradish mixture. If you are interested in how real wasabi looks like, check out here. These are blend options with some real wasabi. Product of Japan. Real wasabi blend from Shizuoka. No artificial scents or coloring. Product of Japan. Real wasabi is used. No artificial coloring. Product of Japan. 100% pure sesame oil. Not a blend. Pickled plums. Fruity and intense tangy and salty flavor. The traditional red color comes from the red shiso leaves added to the pickling brine. Good for sushi, rice balls, salad dressing, dips, dashi stock soup and shochu. Paste form is usually a cheaper option than whole umeboshi. First three on the list are paste. No artificial coloring. Widely distributed and affordable choice. Umeboshi puree comes in a tube. Made from high quality umeboshi using artisanal methods. Product of Japan. All natural. Made by only traditional methods of fermentation. Imported from Japan. A product of a privately owned UK company. Good quality umeboshi can be pricy! Premium grade plums from Wakayama, Japan. Soft skin, substantial meat with small pits. Additive free. We love noodles! Somen (thinest), Hiyamugi, Udon, Soba (buckwheat) and Ramen to name the most popular ones. 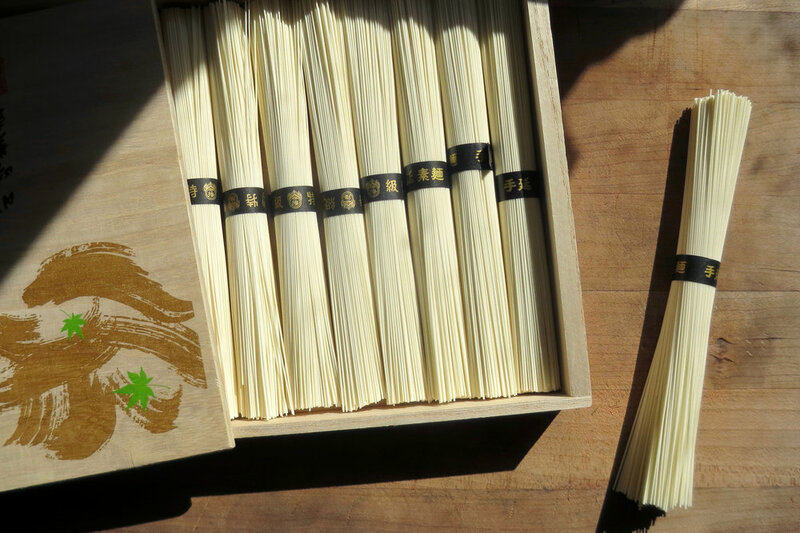 The most popular somen brand in Japan known for its smooth, al dente texture. Product of Japan. Preservative free. Product of Japan. Classic Kyushu style. Great texture. Made from 100% soba flour without any use of binding agents. Product of Japan. If you are looking for thicker/rounder udon common in US, try a frozen section at a nearby Asian supermarket. Frozen noodles could be as good as dried. Made of oriental mustard seed. Much spicier than the yellow mustard commonly used in the US. Good with fried food, fried noodles, sandwich, natto, oden. Product of Japan. No preservatives. Spice mixture of seven ingredients. Great for miso soup, udon, soba noodles, grilled meat or fish. Makes a great dipping sauce just by mixing with mayo! Well known togarashi brand with a long history. Good balance of heat and aroma. Their seven spices include chili pepper, tangerine peel, sesame seeds, ginger, shiso herb, sansho pepper and hemp seeds. Widely distributed here as well as in Japan. Good affordable option. 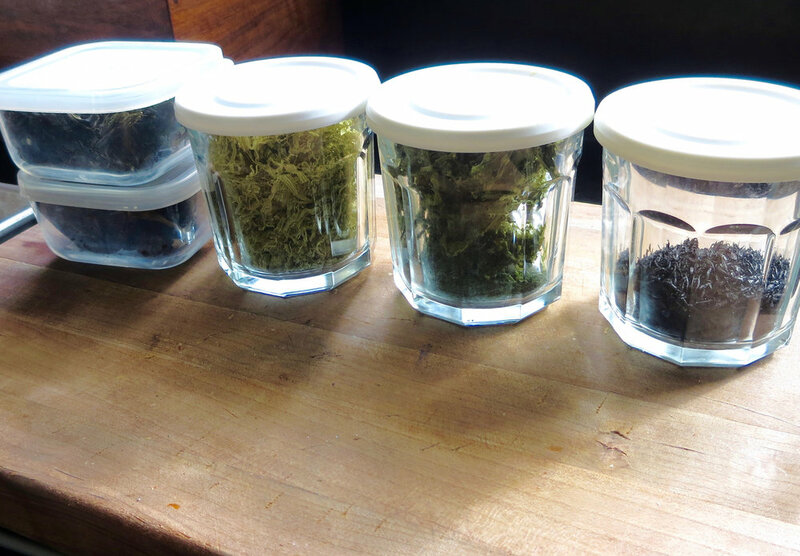 Their seven spices include orange peel, black&white sesame seeds, cayenne, ginger, Szechuan pepper and sea weed. Potato starch. Thickner, binder and used for deep-frying. Product of Holland. All natural. All natural. No sulfites. Not bleached. Dried bread crumbs made of white bread. It gives a crunchy coating for deep-frying and grilling dishes. Also used as thickener and binder. Product of USA. There aren't many options I could find. I am still on the hunt for good panko in California. Or look for “Shop in Bulk” section at a supermarket. That has been my best bet so far. Tender, sweet and nutty sea weed. Rich in vitamins, minerals and iron. It is usually sold dried and cut in small pieces. Good for miso soup, soup noodles, salad, hot pot and marinated dishes. Product of Fukuoka, Japan. Additive free. No preservatives. Cultivated off the shore of Ise, Japan in the mineral rich arctic currents. Hand harvested.